Warner Brothers announced today that they would be moving their titles from HD-DVD to the Blu-Ray format. Many have suggested that this marks the end of the next generation DVD battle, though two major studios continue to have exclusive HD-DVD distribution deals in place. 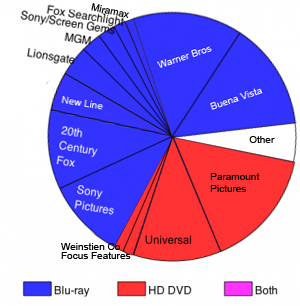 Even before this new marketshare advantage, however, the New York Times reports that Blu-ray titles had outsold HD-DVD offerings as much as 2 to 1, and had even been chosen for exclusive distribution by Blockbuster. Apple has been a member of the Blu-ray consortium's board of directors since 2005, but has not publicly announced their Blu-ray plans. Some expect Apple to officially launch Blu-ray support at Macworld San Francisco.